She was walking on the leash without dragging her owners down the street!!! 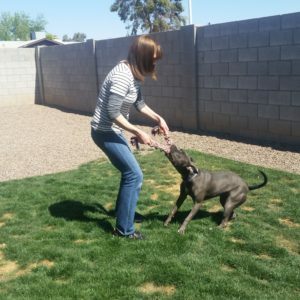 Mike & Maisha Hagan, from Gilbert, AZ, first contacted us because they were looking for obedience help with their Blue Nosed Pitbull, Bella. After sitting down and talking with us they realized they could take her training so much further. They were looking to just have her listen in the home and act better with their cat and then decided that was worth the effort to get her walking nicely, calming down inside the crate and relaxing inside and outside their home. They could have a great dog that they could really enjoy with advanced training. Bella was signed up for our Boarding School Program and arrived excited with that huge pit smile. She was so happy to get started learning how to listen to commands like “Come”, “Place”, “Down” and a loose leash walk. 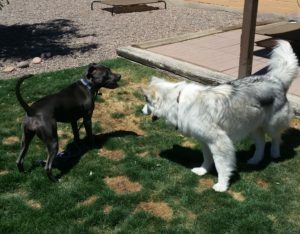 She was also happy to begin learning how to interact with other dogs in a polite and nice way. 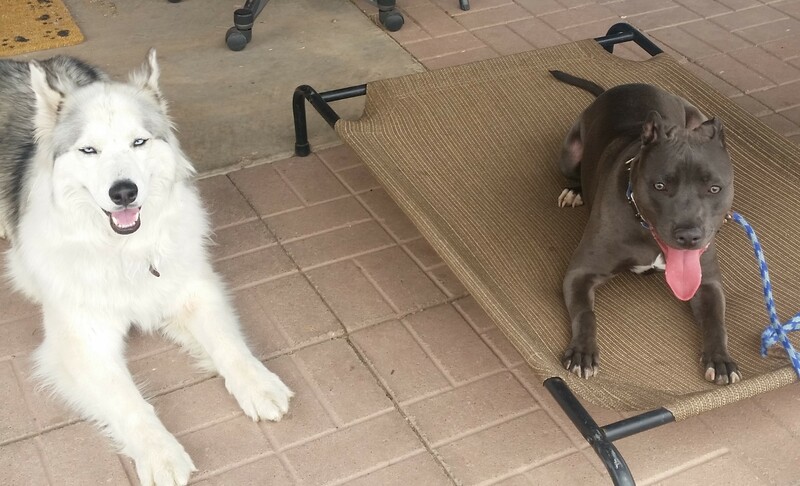 After only the first few days here at Kona’s Dog Training, Bella showed great progress. Listening to commands regularly and calming down while she was in her crate. She also began to play at other dogs levels during the day. She even worked hard on not jumping on people when she got super excited. When Mike & Maisha picked up Bella after her stay with us they said she was a different dog….they weren’t sure if I had switched her, LOL! She listened to them well as soon as they started giving her instructions. She was walking on the leash without dragging her owners down the street and was able to be crated for long periods while her parents were at work. Bella stays with us pretty regularly while Mike & Maisha are out of town and she is doing great when she comes back to stay. She loves to socialize and play. Mike, Maisha and Bella are one happy little family these days!